This is for the ones who got the CP on the net and didn’t find enough photos to understand how was the Santa’s back. It’s my smallest Santa and utterly cute, too :) This was made from 7.5×7.5cm/ 3.9″ and is 5cm/ 2″ tall. 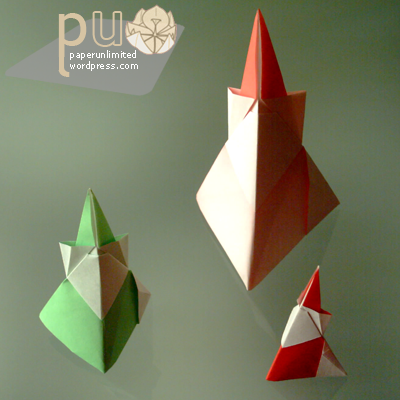 The bigger redish one came from a 15x15cm/ 5.9″ square sheet and the green from 10x10cm/ 3.9″ sheet. They end up with a height of 9.5cm/ 3.7″ and 6.5cm/ 2.6″ respectively. Use paper that’s white on one side and has colour on the other. The bigger Santa is made by paper that is red on the corners and white in the centre. I also made one green since it was Santa’s costume colour before Coca-cola decided to revamp Santa’s closet a little… ;) But a red Santa is definitively more appealing. 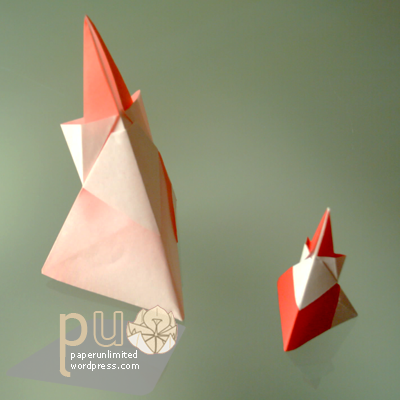 This is diagrammed, step by step so don’t be afraid, on 折紙探偵団MAGAZINE 通巻100号/ Origami Tanteidan Magazine 100. 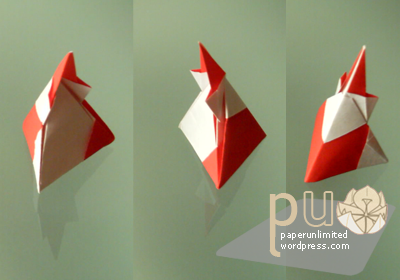 This entry was posted on 2007|11|25 at 13:40 and is filed under origami. You can follow any responses to this entry through the RSS 2.0 feed. You can leave a response, or trackback from your own site.